The house mouse is the most common rodent pest in most parts of the world. It can breed rapidly and adapt quickly to changing conditions. In fact, a female house mouse can give birth to a half dozen babies every THREE WEEKS, and can produce up to 35 young per year. House mice prefer to eat seeds and insects, but will eat many kinds of food. They are excellent climbers and can jump up to a foot high, however, they are color blind and cannot see clearly beyond six inches. Micro droplets of mouse urine can cause allergies in children. Mice can also bring fleas, mites, ticks and lice into your home. To keep mice and other rodents out, make sure all holes of larger diameter than a pencil are sealed. Keep areas clear and store boxes off of the floor because mice can hide in clutter. Don't overlook proper drainage at the foundation and always install gutters or diverters which will channel water away from the building to prevent ideal conditions in which house mice can nest. Regularly inspect the home for signs of mice including droppings, gnaw marks and damaged food goods. 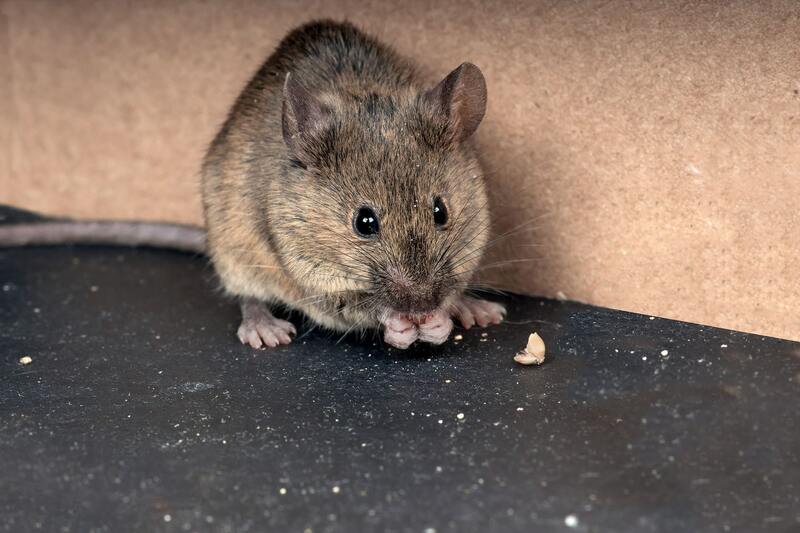 If you suspect a rodent infestation, contact us to treat and get rid of house mice. House Mice - Did you know? The house mouse is the most commonly encountered rodent in homes. House mouse not only is a nuisance but can damage and destroy materials in a home by gnawing. Urine stains and droppings cause a horrific odor. A mouse can squeeze into a space as small as a dime. The house mouse stays within 25 feet of the nest its entire life. The average litter size for mice is about 6 with about 8 litters per year. A female can have a new litter about once every 40-50 days. A mouse can gnaw through foam used to plug holes.